One area where we give ourselves in the hand of technology is air traffic. As soon as we enter an airplane we have to trust a complex machinery and hope that machines, pilots and ground personal are doing their job right and bring us safely back to the ground. But flying does not only involve airplanes and well-trained pilots but mountains of data about airports, airspaces, run ways, weather conditions etc. etc. A important acronym in this domain is ATM which stands for ‘Air Traffic Management’. Two of the most important organizations in air traffic are the Federal Aviation Association (FAA) and Eurocontrol. Together both organizations developed a conceptual model of the whole aeronautical domain and also offer an implementation of that model in XML Schema. This is the technological foundation for Aeronautical Information Services (AIS) that allow the digital exchange of data between all relevant parties. However it takes more than a schema to build an application. The schema describes all the entities, objects and their relationships and it’s up to the software vendors to build complete solutions from that. All the data that are needed to ensure a high level of safety in the operation of air traffic must be entered by humans and those need good user interfaces to do their job. The gathered information is then used on-flight to give pilots up-to-date information about outages, special conditions at certain airports, restricted airspaces and so forth. This is where XForms comes into play. The aforementioned schema consists of about 4 megabytes of schema definitions and about 150 ‘features’ and same amount of ‘objects’ as they are called in this model. These ‘features’ and ‘objects’ can then be combined with each other, nested within each other and linked to other ‘features’ and ‘objects’. All this happens at runtime when ground operators build complex messages from the available set of entities. Though clean from a conceptual view this highly dynamic model puts heavy burdens on the engineers and eliminates any possibility to build static user interfaces to support all types of messages. Fortunately the authors of XForms decided to build it upon XML and as such it is ideally suited to be generated from a formal description such as a XML Schema. The application described here was build by a leading vendor of Air Traffic Control (ATC) solutions.Their engineers have choosen a SOA approach to provide maximum flexibility and connectivity with other applications. In the backend a large Oracle database is used to store all the collected data. The whole user interface for collecting and maintaining the data is generated from the XML Schema resulting in about 300 separate XForms documents using several dozens of custom datatypes. Each form comes with its own template instance which represents one entity from the schema. Those template instances are then aggregated at runtime to build a certain message to be stored in the database. 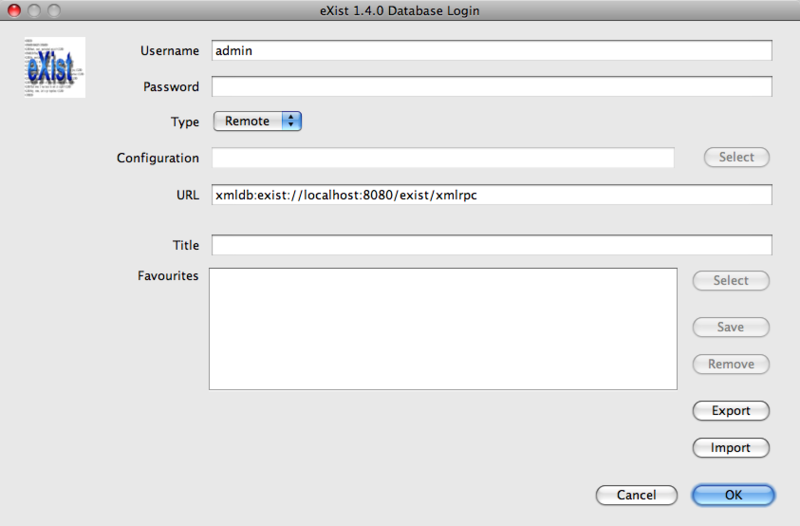 This extension has already been proposed for XForms 2.0 which is currently under development. Additional challenges had to be met: we needed a way to exchange instance data of a subform with their respective ‘master’ and to allow to ‘mount’ some piece of data into the master instance to build a complete messages. We developed several solutions to this that do not break the encapsulation of the target model but discussion of the details is left to another blog post. Further we had to find a user interface presentation that allows an operator to keep the overview over a complex document. To solve this we implemented a tabbed control behaving like a XForms repeat – for each loaded subform a tab is dynamically added and shows the respective subform within it. An additional breadcrumb navigation helps to keep track of the hierarchy in the document. Last but not least the instance data of a stored message are not allowed to contain empty nodes. Thus when loading a stored message for editing the data had to be merged with their template instances. This was solved with a XSLT transform to be executed whenever a message was read from the web-service layer of the database. After heavy and serious testing the customer was able to deliver the first implementation of the standard worldwide which is now in production use in several countries. Soon after first release the generative approach proved itself valuable as the application needed to be migrated to a new XML Schema version. With a single excecution of the XForms generator the new forms were available and could be used right away. The teaching application itself is Open Source and can be downloaded from sourceforge. This post guides you through the first steps of installing, running and using betterFORM limeGreen. Though betterFORM can be run in a variety of deployments and configurations this document focusses on betterFORM XRX. This is a bundling of the eXistDB XML database with betterFORM in a ready-to-run configuration along with a dashboard to help you manage your applications. Before you start you need an installation of betterFORM XRX. Goto the sourceforge download page and get the latest version. This will download the betterFORM installer. 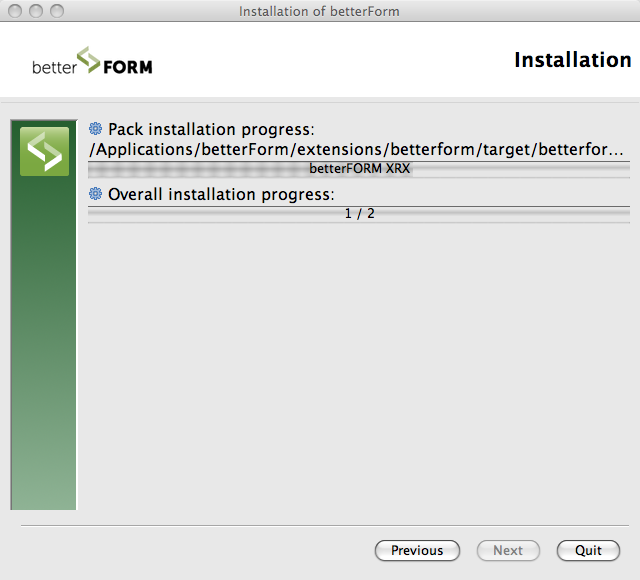 After the download is finished double-click the betterform-install.jar to open it. Please note that Java must be installed on your system and jar files must be configured as executable (which is the case by default). After you have accepted the license terms and specified the installation directory you will presented with some readme information. Skip that screen to get into the package selection. 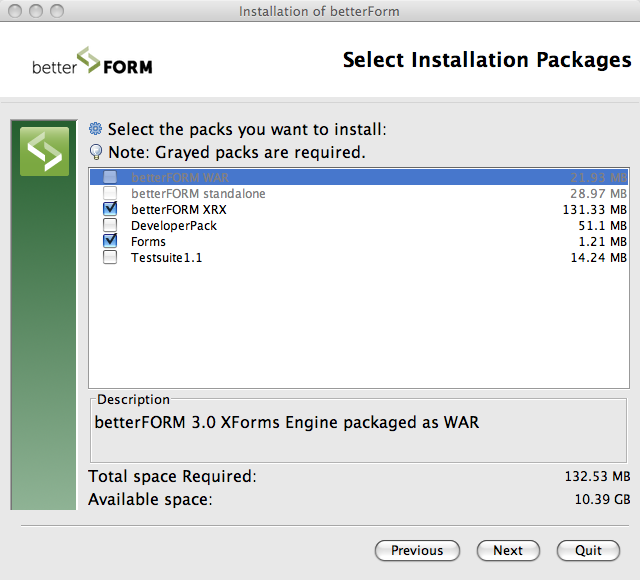 For the scope of this article we deal with betterFORM XRX which is already selected by default in the installer. Just hit the ‘Next’ button to go to installation screen. During this step the betterFORM will be installed on your disk. The following screen lets you choose a password for the ‘admin’ user. Please memorize this password as otherwise you’ll be locked out of the database. If you are just test-driving you may leave the password empty. After this is done hit ‘Next’ a last time to finish the installer. A small application with betterFORM logo will appear. Clicking on the icon will run your default web browser with the entry page. The ‘Dashboard’ will be the default entry page when you browse a new betterFORM installation. 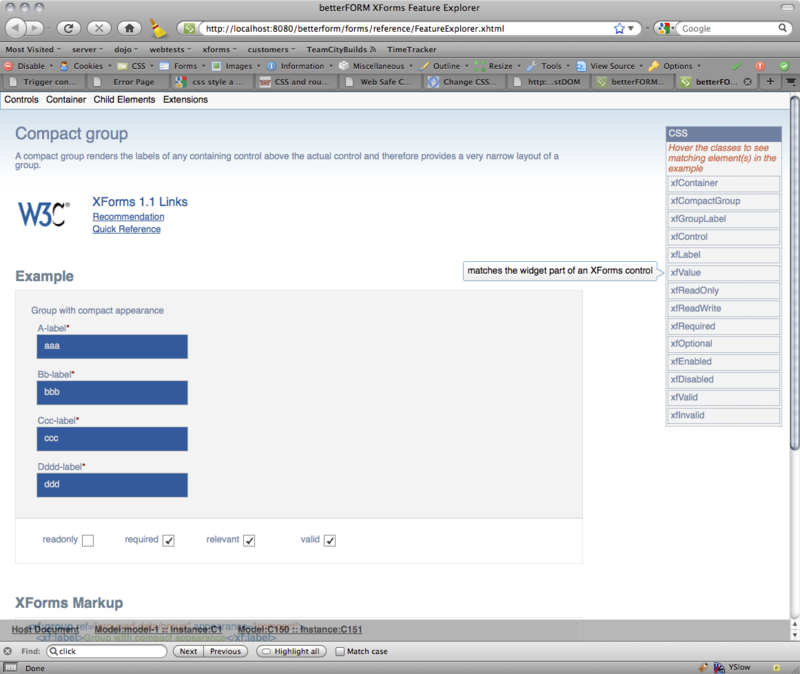 Besides browsing and running the XForms, you can add files and collections to your application and view the source. One of the items found on the Dashboard root level is the Feature Explorer. 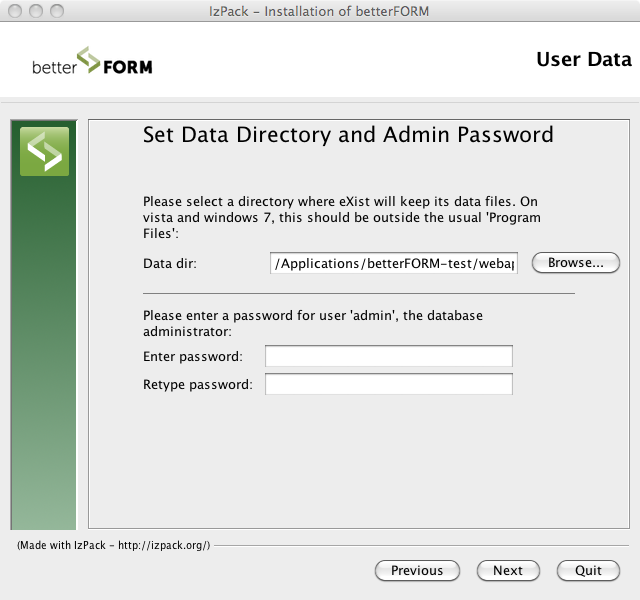 It is the central location for running the reference forms of betterFORM. They serve as a live documentation of XForms and betterFORM features and show you working markup examples and the rendered output. Some of the pages will have links to the respective sections in the XForms 1.1 Recommendation and the XForms 1.1 Quick Reference documents for quick lookup of syntax details. On the right hand there is a CSS reference that highlights the matched elements when hovered. The Feature Explorer will be extended with further examples as new features become available. Under the hood Feature Explorer makes heavy use of form embedding. All embedded forms can also be run standalone by browsing the ‘reference’ collection with the Dashboard and clicking on the respective link. Please note that this is only the first version (0.1) of the application and we plan to continuously extend it to show more features and solution patterns. Therefore not all menu buttons are already working. Please use the ‘filter’ to select a start date before 01. June 2010 to see all the sample data. 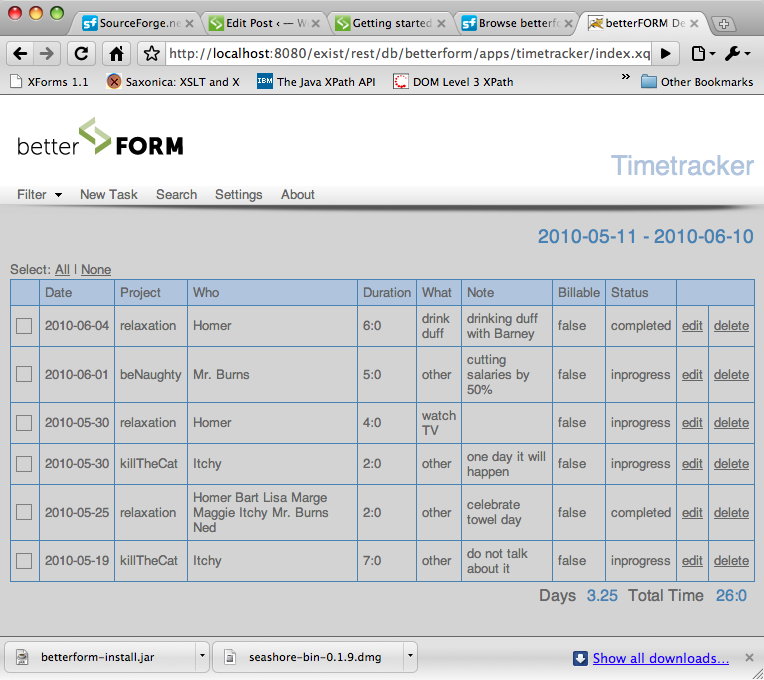 TimeTracker is a simple application to track the time spend on a project and we use it internally log our working hours. As such TimeTracker gathers small XML files in a database collection and allows to create, edit, delete and filter those entries. The whole application consists of a bunch of files organized in a collection hierarchy stored in the database. TimeTracker uses XForms, REST and XQuery to model a complete application. The XForms are generated by XQuery code and XForms embedding is used to assemble the different documents into one single-page application. The data can be filtered by several criteria and are returned as a plain HTML table. The table is then embedded into the main page of the application (index.xql). A single entry in our time tracking is represented by a ‘task’. 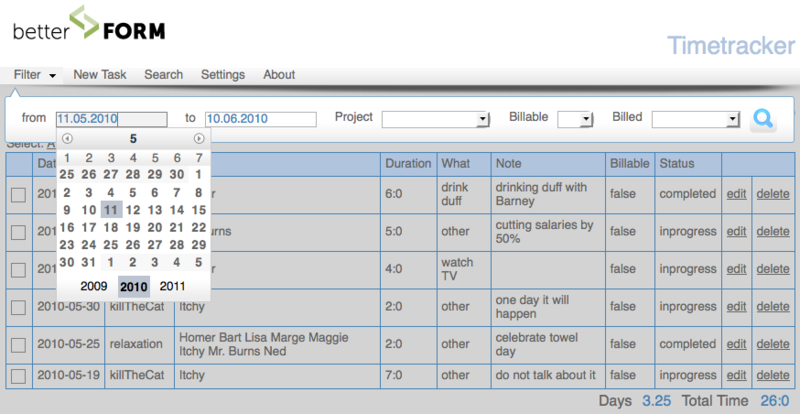 Tasks are always shown for the selected date range which is displayed in the upper right. By choosing the ‘Filter’ button from the toolbar you can change the displayed date range. Please play with the filter fields to see more or less entries. The form selects a default date range that starts 30 days before today. To see the gears TimeTracker was made of it’s best to use the eXistDB Java admin client and take a look into the XQueries and XForms that make up the application. 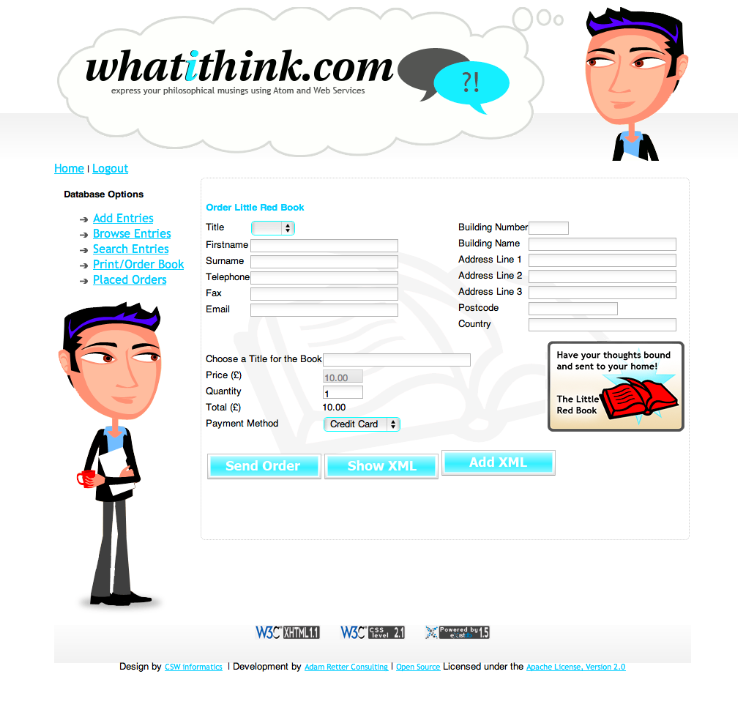 To access the admin client please first goto http://localhost:8080/betterform. In the right upper corner of the Dashboard you find a blue button with an eXist icon. Hit that button and the admin client will download and start automatically. Please use the password you have choosen during install to login and close the dialog. Otherwise the application will not show up. Go to collection ‘betterform/apps/timetracker’. This is the root collection of the application. You can directly access any file or collection by double-clicking on it. You should start your investigation with ‘index.xql’ with is the main page of the application. All other documents or generated contents will be embedded dynamically into this page. index.xql is simply an XForms document wrapped as an XQuery. XQuery does not do anything here. It’s just to see it’s possible 😉 Instead we could have just stored a XHTML document here. Further files of interest are ‘edit/edit-item.xql‘ which is the creation and editing form for the application and ‘list-items.xql’ which is responsible for generating the results table. You will find some more files in the database and not all of them are already active. This is only a first glimpse on the application and betterFORM XRX. A follow-up post will go more into the technical details of how the pieces fit together and show how easy and powerful the combination of XForms REST and XQuery is.